Those Arabian rugs of yore, which could whisk a rider across a desert or into a sparkling palace, are still magical to kids of all ages. 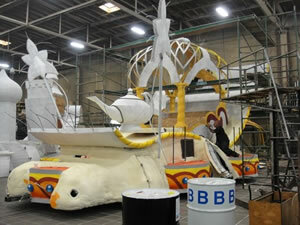 Phoenix Decorating Company and Kiwanis International caught that spirit with “A Child’s Magic Carpet Ride” in the 2013 Rose Parade. 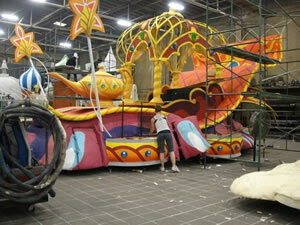 The orange and blue rug seemed to be itching to fly off the float and over the gawking crowd. 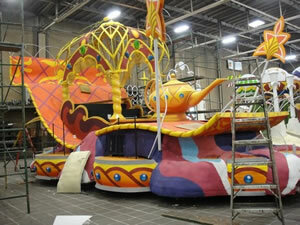 A golden carriage rested in the center of the rug, and at the front was, of course, Aladdin’s bejeweled magic lamp. Riders sat in the carriage or stood around the edges. 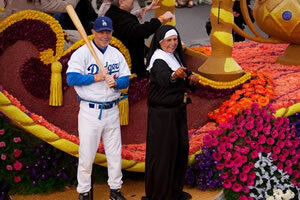 They included a baseball player wearing Dodgers No. 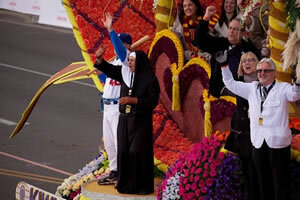 42 in homage to Pasadena’s own Jackie Robinson, a dancing nun, and a doctor in a lab coat. One of the riders was Ms. Wheelchair California Shira Leeder. 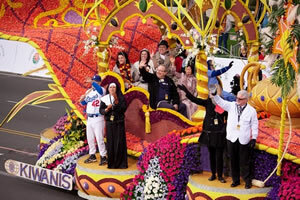 Flowering included 1,000 roses in white and dark lavender; 850 carnations in pink, orange, peach and lavender; and 900 gerberas in orange, lavender and white. Cascades of iris, gerbera and roses in pink, white, lavender and blue flowed under the carpet and over the base of the float. Kiwanis International strives to better children’s lives through their Worldwide Service Project, which is a series of projects to eliminate childhood diseases. Currently, the Eliminate Project joins Kiwanis International and UNICEF in eliminating maternal and neonatal tetanus. 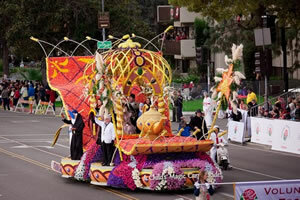 The theme of the 124th Rose Parade and 99th Rose Bowl Game was “Oh, the Places You’ll Go!” The Tournament of Roses is a celebration that lasts several weeks in the fall and winter, with the high points being the Rose Parade and the Rose Bowl Game on New Year’s Day.